Contract: Thermal Engineering’s contract was to supply two 1,000 kW (duty/standby) York air cooled chillers, with a skid containing 2 chilled water pumps, 8 process cooling water pumps, 4 heat exchangers, a chilled water buffer tank, a process cooling water storage tank and an electrical/control panel, with interconnecting pipework and wiring, and total cooling system. 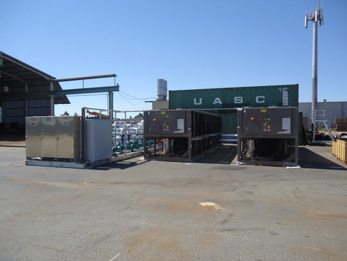 To supply a refrigerated system to produce process cooling water to serve four items of mine equipment. Supplying the water at different supply temperatures to meet the individual mine equipment requirements.